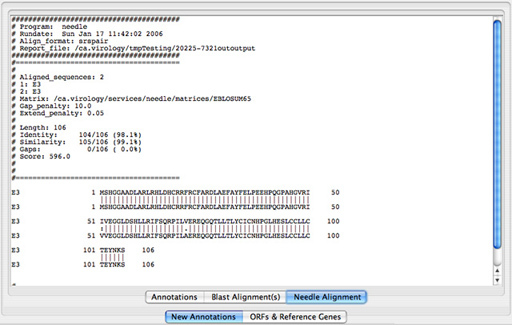 Introduces the user interface of the Genome Annotation Transfer Utility. “Preferences” allows you to define parameters for BLAST and NEEDLE and other annotation features within GATU; you can also set display preferences here. To load either a reference genome or a genome to annotate click on the appropriate “Upload Genome File” button. If you select the button corresponding to the reference genome, you will be prompted to enter the name and location of the GenBank file you wish to use (GBxml or plain text format. Important: Make sure the selected file name does not contain any spaces). 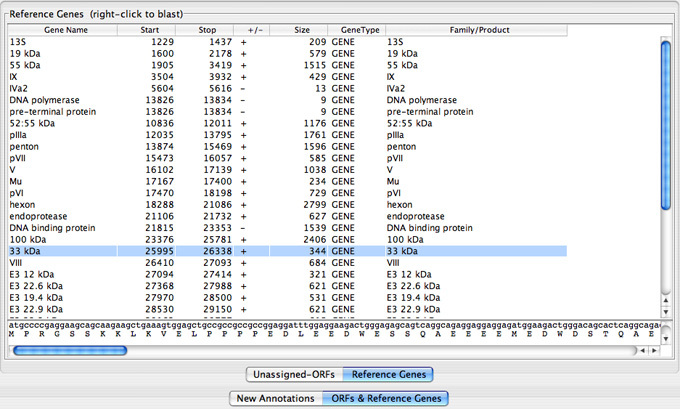 Once the file is read, the genes defined in the GenBank file are shown in the Reference Genes Table. In the “Annotations table” all possible gene annotations for the genome to be annotated (excluding unassigned ORFs) are displayed. These genes are either homologs of genes in the reference genome or ORFs of length greater than the ORF length defined in the preferences. 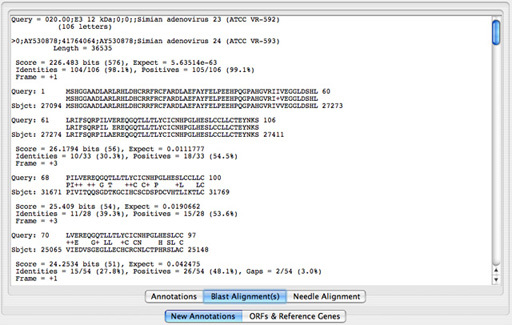 Lists the gene annotations found for the genome to be annotated. 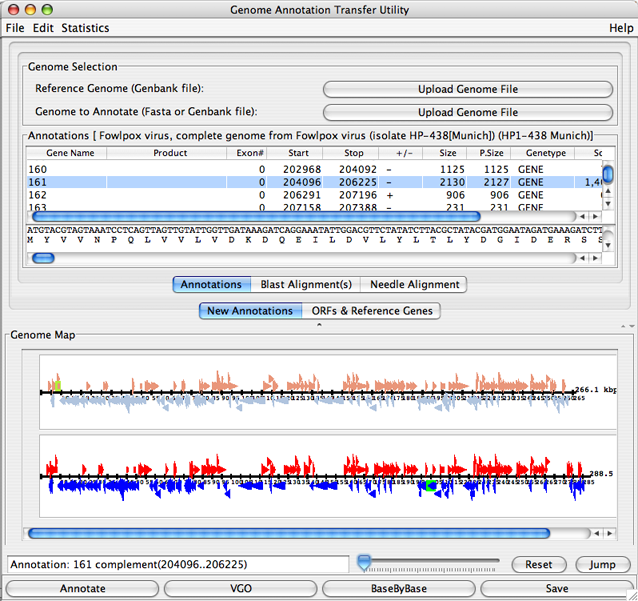 Clicking on any row in the table results in the display of the DNA and corresponding protein sequences of the selected annotation in the narrow window directly below the “Annotations” window. Selecting a row in this table will highlight the corresponding gene in the “Genome Map” window while clicking on a column header will re-sort the list of annotations based on the column header you select. All columns are editable except for “Size”, “P.Size”, “Score” and “% Similarity”. 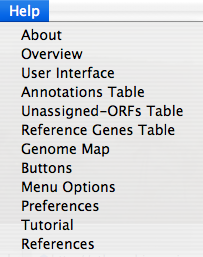 The Unassigned ORFs table displays the ORFs of the genome to be annotated (excluding the ORFs that have already been listed in the “Annotations table”). The Reference Genes Table displays the genes of the reference genome. Clicking on any gene shown in the map will display the name of the gene in the text box directly below the “Genome Map” window. The slider directly across from the text box provides a zoom function; you can increase the size of the image to a maximum of 20 times the original size. The reset button will reset the image to its original size and deselect all genes. Thejump button will skip ahead in the genome map to the view of the genes selected in the “Annotations table”. To submit an annotated genome, the requirements are a “FASTA file” and a “Feature Table” if you use SEQUIN. To learn how to prepare these wp-content/uploads/2018/12 for submission, refer to this guide.